Holders Celtic cruised into the Scottish League Cup final courtesy of a 4-2 win over Hibernian at Hampden on Saturday. 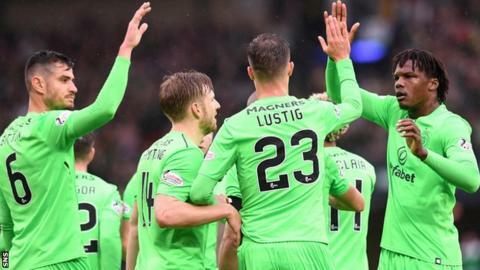 Defender Mikael Lustig bagged a double and substitute Moussa Dembele repeated that feat as Celtic stretched their unbeaten domestic run to 60 matches. Anthony Stokes penalty for Hibs had made it 2-1 and Oliver Shaw's goal got the Edinburgh side back into it at 3-2. Here, former Scotland striker Steven Thompson, who won the League Cup while with Rangers, rates how the players shaped up at the national stadium. The keeper was at fault for Celtic's second goal and their fourth, mistakes you simply cannot afford to make in games of this magnitude. He lost his runner, Mikael Lustig, at the crucial second goal. I'd expect a lot better from a player of his experience. Like his central-defensive partner, Paul Hanlon, he had a solid game. His distribution at times was very good. Defended well throughout the match until Hibernian were stretched towards the end as they went in search of goals. Did well in his battle against Celtic winger Patrick Roberts, snuffing out the on-loan Manchester City man's undoubted threat, without getting forward as much as he can do. Sacrificed at half time as his manager tinkered with the shape, hadn't made much of an impact on the game. Grew in stature as the game went on and played some wonderful passes in the second half, getting through the Celtic lines. Looked very comfortable on the ball and was involved in the second goal. Hardly gave the ball away all game. Looked better when he took up a more central position in the second half, should have scored from Steven Whittaker's cross. The on-loan Manchester City man has amazing pace and is very direct, but he didn't offer the threat his ability suggests he is capable of. Frustrating afternoon for the former Celtic striker. He was isolated in the first half but took his penalty well to get Hibs back in it. Had an impact by wining the penalty and was a threat down the wing thanks to his pace. Really effective after coming on. He provided a brilliant cross for Slivka's chance and played a delightful pass for Oliver Shaw to score. Young man timed his run to perfection for his goal and showed great composure when the ball reached him. A day he'll never forget despite the result. The keeper made a few stray passes in the second half but he could do nothing with the goals and was largely untested. The Swede showed great opportunism in the opposition box to get his two goals, and also handled Barker's pace well at the other end. It was largely a comfortable afternoon for both centre-halves. The Israeli was rarely tested and looked composed throughout. Wrongly adjudged to have brought down Boyle for Hibs' penalty. Other than that it was a commanding display from the big Belgian. Reasonably quiet by his own high standards but made some strong runs late in the game, showing his superb fitness levels. Quietly effective display from the captain in Celtic's engine room. Better second half than first and I'm sure he would have been hoping to make a bigger impact on the match. Didn't carry the same goal threat as he usually does, failing to make his usual runs in behind the defence. Seemed to be lacking energy. He struggled to get past the full back and his final pass and decision making let him down. Not the dynamic winger we know he can be. He has played much better for the Scottish champions but still carried a threat. Worked really hard as always but with only one goal to his name from his last eight domestic games, Griffiths will be looking over his shoulder at the returning Moussa Dembele. Should consider himself unlucky not to have started the match ahead of Roberts. Looked hungry to stake his claim for a starting berth. He took his two goals well and could have had a third. Looks ready for a starting place. Surprised he didn't start the match but was maybe being kept fresh for the Aberdeen game.